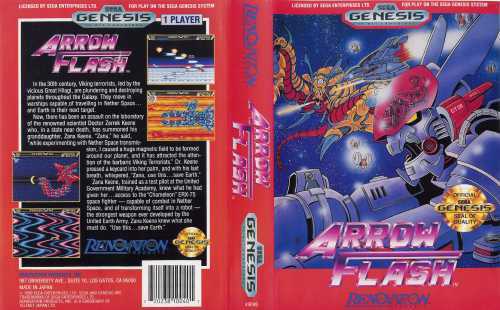 Arrow Flash(tm) has good graphics, and you get weaponry quickly. That's the good news. The bad news is, it's tough to see the bad guys and the shots coming toward you. So try ARROW Code 19 for infinite arrow force shots, or Code 11 for invincibility to help you out. Instead of the normal 3, 5 or 7 lives, start with more (ARROW Codes 1 thru 7 and 10) or fewer (Codes 8 and 9). 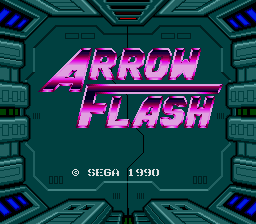 ARROW Codes 12 thru 19 let you start with a selected number of arrow force shots instead of the normal 3 stock mode shots, but have no effect in the charge mode. The effect of Codes 20 thru 24 seems to get less and less as the game goes on. 1 Invincibility At the option mode, change Arrow Flash from Stock to Charge. Wait for the play demo (after the story demo), then hit Start until the game begins. Now, each time you press C for 3-5 seconds, you will become invincible for 10 minutes! aliens from hell all by her lonesome. about it is the 15-second cinema during the game demo. The Scribe is about accurate with this although I do think that as shooters go it is pretty decent. The opening cinema is okay but not nearly as impressive as others like say Mega Turrican. The most annoying thing about this game to me is that the tunes are uninspiring and ther is so much activity onscreen at once that it can be very difficult to see the enemy and their oncoming fire. I would have to disagree with both of the above reviews. 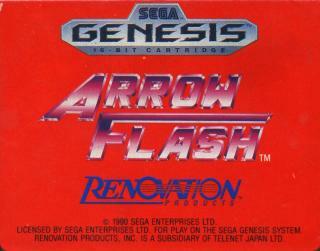 Renovation made some of the best and most challenging shooters ever for the Genesis (Gaiares, anyone? ), and this one is no exception. 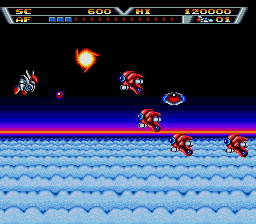 One unique feature of this game is the option you have of transforming from a jet into a robot, which made the formation of your bullets more effective but also made your body larger--more difficult to maneuver through tunnels and away from enemy bullets. This added a strategic element to the game, as well as a coolness factor, especially if you like the Transformers as I do! This is an ok shoot-em-up. It isn�t all to good. But not that bad either. There are better games, but there is some good things about it, like an animated intro and quite fun levels. i agree with Gibb. it isnt that bad at all (especially if its by renovation, who made some great games, especially with wolf team) and its just fine. I have almost every MD renovation game. i give this game an A. very entertaining even if the graphics are so called "primitive" and people seem to think that just because they dont like it, it must be knocking off of something else. lies. to heck with the scribe! I have the Japanese version of this game and it is rare when a shooter holds my attention - and this one does, so for that reason alone I will recommend it.